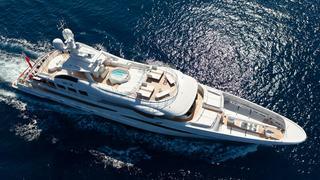 With the announcement of the shortlisted nominees for the World Superyacht Awards 2013, we take a closer look at the finalists in each of the major categories. Here with have the Displacement Motor Yacht 500 to 1,299GT category, in which five yachts are shortlisted. This yacht’s voluminous interior, one of the largest for a yacht of this size, was created by Delta Design in a Polynesian style with Balinese touches. Comfortably accommodating 12 guests, the layout includes four double guest cabins on the lower deck and a dedicated upper deck for the owner with a suite, lounge, private outdoor deck, dining area and a room that can be customised for children or family members. A gymnasium and private office are located on the main deck in the space typically allocated for the master suite. Arianna is powered by twin 1,650hp Caterpillar 3512B engines giving a top speed of 16 knots, a cruising speed of 14.5 knots and a range a 5,000 nautical miles at 13 knots. Special features include an elevator giving access to all decks, including the sundeck. Garçon is the support vessel to the Lürssen superyacht Ace. With a length of 67.15m, Garçon 4 Ace is also the largest vessel in the Sea Axe range: she has 360m² of exterior deck space and 140m² of interior deck space accommodating 21 crew and staff. Powered by four 1,425kw Caterpillar engines, she can reach a top speed of 25 knots, with a range of 4,500 nautical miles at 18 knots, and her special Axe Bow allows her maintain high speeds in all sea conditions. Special features include a helipad fully certified for large helicopters. 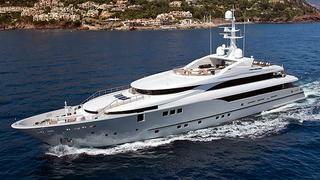 Rahil is the second 53.8 metre motor yacht delivered by Mariotti Yachts. 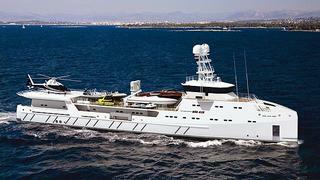 Designed by Luca Dini, she’s very similar to her sistership, Sea Force One, launched in 2008. 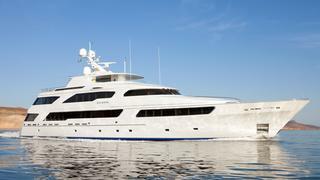 Rahil _accommodates 12 guests in a full-beam master on the main deck with two side balconies, a VIP on the bridge deck (this was a gymnasium on Sea Force One), two further VIPs and two doubles on the lower deck. ABS classed, RINA Comfort classed, and MCA compliant, _Rahil was built in steel and aluminium with all engineering done by the yard. Her twin 2,720hp Caterpillar engines give a top speed of 17.5 knots, a cruising speed of 14 knots and a range of 5,000 nautical miles at 12 knots. Hanseatic Marine’s 77m motor yacht Smeralda follows the much-acclaimed 73.5m motor yachts, Silver and Silver Zwei, which were the brainchild of a German owner. Her accommodation features walnut panelling with nine guest cabins and a massive owner’s apartment utilising the entire upper deck and including a large, private, aft-facing terrace. Built in aluminium, Smeralda is finished to an extremely high standard. She is powered by twin 2,720kW MTU main engines which deliver performance of close to 30 knots, with a cruising range of 4,500 miles at 18 knots. Step One is a 55 metre motor yacht, the first hull of the Amels Limited Editions 180 series. The proud inheritor of the successful Amels Limited Editions 171 and 177 series, the 180 series, like all yachts in this range, is designed by Tim Heywood. At 660GRT, she offers a large interior volume. The main deck saloon is enlarged by 30 percent with an additional bar and seating area. 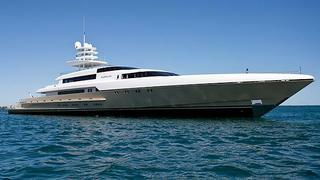 The skylounge is full-beam, and the sundeck is extended with a touch-and-go helipad just above the wheelhouse. The interior, designed by Laura Sessa, accommodates 12 guests in six cabins. The full-beam master suite is on the main deck with its own fold-out balcony. An extra twin cabin nearby can be used for guests or children and four further double cabins are on the lower deck. Keep an eye on our Yacht Features section for the next WSA category – Tri-deck Semi-Displacement or Planing Motor Yachts.